Home > Agvocate, California Farmers, Diet & Nutrition, Know a California Farmer, Social Media	> Fill Your Fridge For Free! Fill Your Fridge For Free! Would you like to fill your fridge for an entire year, for free? Visit the Know A California Farmer Sweepstakes Page. Allow the application to access your FB page. Share your entry on your FB page. Enter each week by repeating steps 4 & 5. For each of your friends that accept your invitation and enter, you get an additional entry! 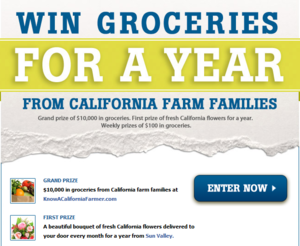 The Grand Prize is a $10,000 grocery gift card from California farm families at Know A California Farmer. First Prize is a beautiful bouquet of flowers delivered each month from Californian Grown Flowers. Weekly Prizes include eight $100 certificates for groceries from Californian farm families at Know A California Farmer.